In today's episode we are going to hear how people talk about experiences. 오늘은 경험을 얘기할 때 사용하는 표현을 배워보도록 하겠습니다. 아래 단어 박스를 살펴보고 단어 의미를 알고 있는지 확인해보세요. What problem did Dan have? Where was Sam when she felt embarrassed? What did Tom do on the bridge? 이번주는 어떤 주제에 대해 얘기했어요? I wanted to ask people about their experiences – so we could find out how to use the words 'ever' and 'never'. I started by asking Dan about being lucky. Dan이 운이 좋았던 적이 있긴 했대요? So Dan, have you ever been very lucky? Yes, once. I got lost going to a party, that hadn't ever happened before! And then I found a map lying on the floor. Ok – what can you tell us about 'ever' here? 보통 ‘ever’는 질문이나 부정문에서만 사용합니다. 여기서 주의해서 들어야할 건 바로 시제인데요. Dan이 무슨 시제를 사용했는지 들으셨나요? Was it present perfect and past perfect tense? 이 질문은 Dan이 아주 운이 좋았던 적이 있었냐고 물어보는 거죠. 또 대답 중 'hadn't ever happened before' 그 전까지는 한번도 없었던 일이었다.. 라는 뜻이죠?. Oh, OK then… next I asked Sam about doing something embarrassing. Have you ever done something really embarrassing, Sam? Oh yes, I have! When I started teaching, I fell over during my first class – it was so embarrassing – someone had come to watch me. It has never happened since, though. Ok, what do you want to tell us about that? 여기서 ever가 또 나왔죠? 'Have you ever done something really embarrassing?' 굉장히 부끄러운 일을 한 적이 있나요? 이렇게 물어보았는데요. 여기서도 역시 ever는 현재완료와 함께 쓰여서 지금까지 그런 적이 있는지 물어보고 있습니다.그 뒤에 현재완료의 부정문에서도 쓰여서 'It has never happened since though' 그 이후에는 그런 적이 한번도 없다라고 했는데요. ‘Never’는 ‘not ever’와 같은 뜻이죠? Anything else about the tense? 네. 자신이 경험한 것에 대해 얘기할 때 과거형이나 과거진행형을 사용해서 좀 더 자세히 설명하기도 하죠. Sam은 'fell over' 넘어졌었고 'it was embarrassing' 그것이 부끄러웠다..라고 말했습니다. Ah, thanks – next I asked Tom about doing something amazing. Hi Tom, have you ever done something amazing? Oh, yes I have, in Guatemala. 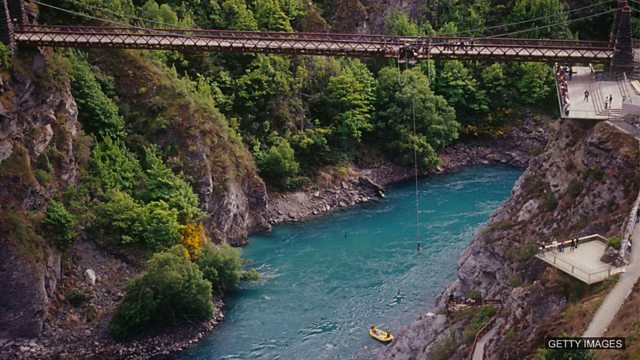 I jumped off a high bridge into a river and I've never felt like that before. 'Have you ever done something amazing?' 이 문장은 현재완료이므로 대답도 현재완료로 'Oh, yes I have' 이렇게 대답했죠. 또 never를 사용한 현재완료 부정문도 나왔는데요. 'I've never felt like that before'. 이렇게 말했네요. Right, I think we need a test to see what you remember! If I want to find out whether my friend was really surprised by someone at some point in their life – what question would I ask, using 'ever'? 자 Phil이 뭐라고 말할까요? Phil은 친구에게 이제까지 누군가에 의해 놀랐던 적이 있는지 물어보려고 합니다. Ever를 사용해서 의문문을 만들어보세요. Have you ever been really surprised by someone? 여러분도 이렇게 말하셨죠? Phil은 'Have you ever been really surprised by someone?' 이렇게 말했습니다. If you got that, that’s brilliant. Right, I haven’t ever let this programme go on too long – and I'm not going to start today – let's finish here. Thanks, Phil! 오늘은 ever와 never를 살펴보고 완료 시제에서 어떻게 사용하는지 함께 배워보았습니다. 다음시간에도 English in Action에서 함께해요. 바이! ‘ever’는 ‘언제든’이라는 뜻으로 사용하며 보통 의문문이나 부정문에서 사용합니다. 현재완료형에 쓰여서 ‘현재 이전 언제든’이라는 뜻으로 사용합니다. 과거완료형과 쓰인 경우는 ‘그 과거시점 이전 언제든’이라는 뜻으로 쓰입니다. Have you ever been very lucky? Have you ever done something really embarrassing? Have you ever done something amazing? That hadn't ever happened before. I've never felt like that before. To give more details of these experiences we use the past simple or past continuous tenses. I found a map lying on the floor. I fell over during my first class. I jumped off a high bridge into a river.